My relationship with first-person shooters has been a somewhat tumultuous one. If pressed to come up with a list of my favorite video games of all time, titles like Quake, Perfect Dark and Half-Life 2 would probably be on it. I’m one of those weird people who actually buys the Halo and Call of Duty games so I can play through the campaigns. Over the last year or so, my taste for the genre has soured, though. Chalk it up to evolving interests or a lack of developer innovation but my recent attempts to play Crysis 2, Killzone 3 and Call of Duty: Black Ops were aborted after only a few hours. 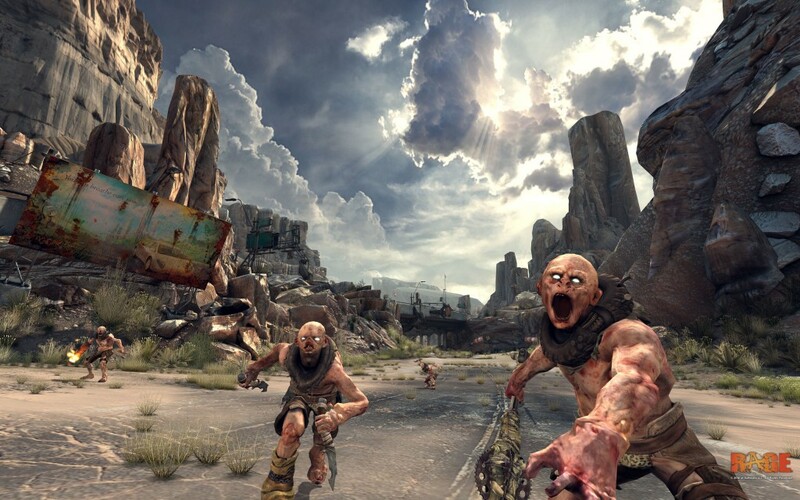 It was with a fair amount of trepidation then that I approached RAGE, the first new game from id Software (makers of the aforementioned Quake) in almost 7 years. Would this long-in-development shooter be another victim of my changing tastes? Or could id, a developer who more or less invented the modern FPS, successfully renew my love for the genre? RAGE opens with a stunningly animated cinematic: a massive asteroid hurtles through space, scraping across the surface of the moon on a path with our glowing, blue Earth. Meanwhile, a group of silver-suited individuals are injected with “nanotrites” and sealed inside cryogenic chambers. One of these people, you’re led to believe, is you. This is an Ark, and you’ve volunteered to be buried deep inside the earth in the hopes that you’ll survive the asteroid impact and that “mankind will live to see another day”. It’s gripping stuff, and it plays out with such a sense of elegance and drama that it’s hard not to be intrigued. You eventually awaken in your chamber and stumble out in to the blinding sun, where a quick series of events finds you indebted to Dan Hagar, the gruff head of a nearby settlement of survivors, voiced with conviction by John Goodman. He hasn’t seen someone like you in a long time, he says, and he graciously offers to set you up with a vehicle and supplies if you’ll take care of a few errands for him. This is where the ultimate structure of the game falls in to place: you’ll meet someone new, get a little slice of their backstory, and then drive off in to the wasteland to kill everyone on their hit list. Why every NPC immediately presumes that you’ll be such a capable kicker-of-asses is never really fleshed out. I was afraid that the driving elements of RAGE would feel tacked-on but, like the game’s gunplay, everything controlled impeccably. The world outside of the few encampments that you’ll visit has been devastated by the game’s opening events: shattered buildings and chunks of highways and bridges are submerged in canyons of rock and sand. Other than the few bandit vehicles that will pursue and attack you as you zip across the wasteland, the world feels appropriately barren and desolate. The graphical acuity of the world is striking, full of massive vistas under a blue sky but, disappointingly, most of it is window dressing: while you can see stuff out there, it’s ultimately inaccessible because of strategically placed Jersey barriers or even invisible walls. While the tutorials will encourage you to explore, I quickly discovered that there really isn’t much in the Wasteland to be found. Outpost residents and enemies are obsessively detailed. These are survivors, and their garments (as well as nearly everything else in their world) look scavenged and repurposed. Townsfolk will engage in brief expository conversations and challenge you to surprisingly full-featured mini-games, including an addictive collectible card game, or even offer you much-needed moneymaking opportunities like delivering mail around the Wasteland. Enemy gangs are easily identified by their dress and, while some of it borders on Warriors-style camp, I quickly learned to anticipate the type of arsenal and adversity that was heading my way by their “colors”. You’ll also have the chance to run frantic races and rallies in your buggy, rewarding you with coveted race certificates which can be used to upgrade your vehicle and its weapons. I was afraid that the driving elements of RAGE would feel tacked-on but, like the game’s gunplay, everything controlled impeccably. Races were fast-paced and, eventually, grew to be quite dangerous; outfitting your buggy and learning the effective use of weapons, gadgets and shields were imperative to survival. Outside of two or three mandatory races, you have the option to skip most of these challenges in the game. Your stripped-down wheels will have a disadvantage on the roads outside of town but you’re otherwise not required to participate. I rather enjoyed the racing, though, and appreciated id’s choice to extend this element of the game to the title’s online multiplayer mode. The weapons in the game are fairly predictable (pistol, shotgun, sniper rifle, etc.) but a modest crafting system gives you the opportunity to assemble unique and devastating types of ammo. The crossbow is an effective silent killer when outfitted with steel bolts but the potential for creative takedowns increases dramatically once you learn to make a bolt that gives you temporary control over your victim’s twitching, shambling body — right up until he explodes in a cloud of bloody viscera and takes down everyone nearby. The enemies respond intelligently to your attacks, calling out your location to their partners and shrewdly seeking cover when the course of battle tips out of their favor. Some mutants will emerge from crevices in walls or ducts and charge headlong at you, weapon raised. They’ll scramble over boxes and furniture, swing from light fixtures and quickly parry out of the way just when you think you’ve got your sights locked on them. These encounters are tense and overwhelming, and my mind raced with strategic options as I searched the area for someplace to hide and plot my next move. Simply put, I loved the firefights in RAGE. The RAGE experience ultimately breaks down because of a number of idiosyncrasies. You can’t pick up weapons from fallen enemies; guns will inexplicably fizzle and bubble until they quickly disappear. Some enemies can be looted for a few dollars and a handful of bullets but others will fade away along with their weapons. Characters killed with grenades or other explosives just disappear altogether. The game features some truly unique locations but, in later missions, sends you back to these areas again. You’ll make your way through them in reverse (one of the trophies actually acknowledges this point) but they remain relatively unchanged from your previous visit. The auto-save feature is particularly frustrating: it activates so infrequently that I resorted to pausing the game every 10 minutes or so to perform a manual save, out of fear of having to replay some 45-minute chunk over again. Lastly, and perhaps most inexcusably, the game has no ending. After killing your way through the final level, a quick cutscene will play and then the credits will roll. Game over. The closing encounter provides no climactic increase in difficulty and no denouement for you or the characters that you’ve aligned yourself with. Outside of reloading an earlier save, you don’t even have the option to go back in to the world to take care of any missed jobs or races. I could have easily overlooked RAGE‘s slight narrative if the game had offered a satisfying finale; sadly, the lack of any closure just makes the whole undertaking feel incomplete. When all is said and done (or, in this case, when all is shot and driven), the things that RAGE does well ultimately save it from being Just Another Shooter. The game is a technical marvel with a flawless framerate, booming audio, unequaled graphics and expertly executed combat. The fact that RAGE doesn’t collapse under a number antiquated structural choices and a poorly realized plot is a testament to the strength of its mechanics. It’s a fun but deeply flawed experience and, while it didn’t necessarily renew my love for shooters, it did fill me with a sense of optimism that some developers are attempting to push the genre forward. Perhaps the inevitable RAGE 2 will get the balance right? RAGE was purchased for review by me and I completed the campaign on the Playstation 3 version in approximately 19 hours. 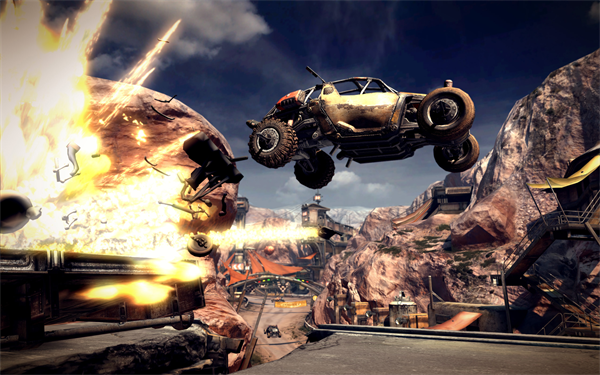 RAGE also includes an online car combat mode and separate co-op missions. For more info on how VGH approaches game reviews, please read our reviews philosophy.